While European lines such as Hapag-Lloyd Cruises have traditionally offered longer world cruises each winter, stretching up to 180 days, most English-speaking lines have stuck to a formula that sees world cruises come in at 105 to 110 days. 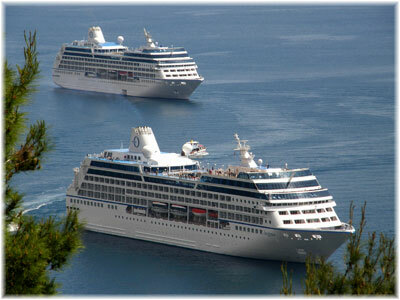 Oceania Cruises, however, has chosen for its first world cruise in 2015 in the 30,277-ton Insignia, to offer an extended 180-day cruise. We take the opportunity of this announcement to look at some earlier world cruises, dating back to 1891 and 1909, and not just to the usually-quoted 1922 of Cunard Line’s Laconia. Finally, we look at an alternative world cruise that is offered year-round – this time by container ship! New from Oceania Cruises, fresh on then news that sister line Regent Seven Seas Cruises had just ordered a fourth new ship, is an announcement that it will offer a long 180-day world cruise in 2015, visiting five continents, forty-four countries and eighty-nine ports of call, in its 30,277-ton Insignia. Departing Miami on January 10, 2015, Insignia will return to the same port on July 8, after a complete 180-day circumnavigation of the globe. Outbound calls will be made at the Caribbean ports and islands of Santa Marta, Aruba, Bonaire, Margarita, Grenada, Martinique, Guadeloupe, Barbados and Tobago before heading along the South American coast to Devil’s Island, Belem, Fortaleza, Natal and Recife, then crossing the Atlantic to Africa, where she is scheduled to call at Lome, Cotonou, Sao Tome, Walvis Bay, Cape Town, Port Elizabeth, East London, Durban Richards Bay, Maputo, Nosy Be, Zanzibar and Mombasa. From Mombasa, Insignia will set out across the Indian Ocean to visit the Maldives, Mangalore, Cochin, Rangoon, Langkawi, Port Kelang, Singapore, Ko Samui, Sihanoukville, Bangkok, Saigon, Ha Long Bay and Hong Kong. From Hong Kong she will then proceed to China, South Korea and Japan, with calls at Xiamen, Shanghai, Tianjin, Incheon, Nagasaki and Kagoshima, thence Keelung, Kaohsiung, Manila, Kota Kinabalu, Brunei, Kuching, Benoa, Komodo and Darwin. In Australia and the South Pacific, she will leave Darwin for Cairns, Whitsunday Island, Brisbane, Sydney, Hobart, Picton, Napier, Tauranga, Auckland, Nuku’alofa, Rarotonga, Raiatea, Bora Bora, Moorea, Papeete, Ruahine, Rangiroa, Nuku Hiva, thence Hilo, Honolulu, Lahaina and Nawilili in Hawaii. The final leg from Hawaii will take in Los Angeles, San Diego, Cabo San Lucas, Huatulco, Puerto Quetzal, Corinto and Puntarenas in the Pacific and Cartagena and Key West in the Atlantic before her early July return to Miami. Two-for-one early booking fares, which are only valid for the next fifty days or so, start at $39,999 per person in an inside cabin, $41,999 in an outside and $55,999 per person in a verandah cabin. The best accommodation, the Owners Suite, is on sale at $114,999 (regular $300,984) per person. These early booking fares are valid until September 17 and include round-trip US flights to and from Miami. If booked by September 17, the fare will also include free upgrade to first-class air travel, prepaid gratuities, a pre-cruise night in Miami, visas for sixteen countries, luggage delivery, unlimited laundry services and Internet. 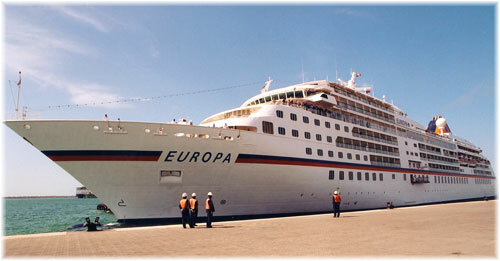 This length of voyage at 180 days approaches the world cruises offered by Hapag-Lloyd’s Europa, which are usually about the same length, and about two-thirds longer than the usual world cruise. “As the leading specialist in destination cruising, we wanted to create a unique port-intensive voyage that reflects the dreams of the true explorer, rather than speed across the seas racing to the next convenient port as is the norm in a typical 100- to 110-day world cruise,” said Kunal Kamlani, president of both Oceania Cruises and Regent Seven Seas. In addition to eleven overnight calls, the Insignia will spend two nights each in Cape Town, Rangoon, Singapore and Shanghai. Contrary to what most sources say, world cruising actually got its start back in 1891 when Canadian Pacific took delivery of the first of three new Empresses, the 5,920-ton Empress of India. Built at Barrow-in-Furness, in the shipyard where BAE Systems is today building seven “Astute” class nuclear-powered fleet submarines for the Royal Navy, the Empress of India was launched on August 30, 1890. After fitting out, she departed Liverpool on Sunday, February 8, 1891, on Canadian Pacific’s first world cruise, one in which it offered a voyage in the Empress of India from Liverpool via the Suez and Hong Kong to Vancouver, a journey across Canada on its own famous trans-continental railway and a Transatlantic liner crossing back to Liverpool. Thus, on Tuesday, April 28, 1891, the Empress of India became the first White Empress to arrive at Vancouver, after a voyage of 79 days, whereupon her world cruise passengers continued their journey across Canada and around the world. Within less than six months, Canadian Pacific offered two more world cruises, with the Empress of Japan leaving Liverpool on April 11, 1891, and the last of the trio, Empress of China, sailing from Liverpool on July 15. This trio, the first twin-screw liners on the Pacific, had been ordered by Canadian Pacific for a new mail contract that connected the UK and Hong Kong by way of its recently-completed transcontinental railway, over which the first train had run between Montreal and Port Moody in July 1886, with the line reaching Vancouver in May 1887. While these were really positioning voyages to get the new ships from Liverpool to Vancouver, this was not the end of the story for Canadian Pacific. More world cruises would follow when new ships were ordered for its Transpacific services and in the 1920s and 1930s, Canadian Pacific would become one of the best-known names in world cruising, with several of its Empresses offering world cruises, and most particularly the 42,348–ton Empress of Britain (ii) of 1931, the first ship to be designed to cross the North Atlantic by summer and offer a world cruise every winter. Three famous Cunard ships would later follow this pattern, including the 34,274–ton Caronia of 1949, the 65,863-ton Queen Elizabeth 2 of 1969 and the 148.528-ton Queen Mary 2 of 2003, which is celebrating ten years of service this year. 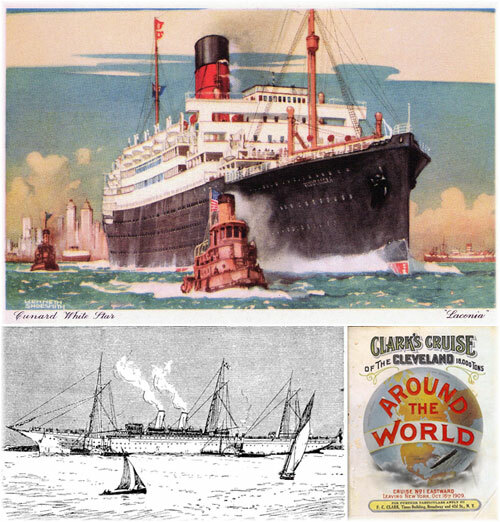 After the delivery voyages of Canadian Pacific’s Empresses, the next stage in world cruising occurred in 1909, when a new world cruise routing was offered by Frank C Clarke of New York, an early organizer of cruises, who chartered Hamburg America Line’s 16.960-ton Cleveland to offer two world cruises five years before the Panama Canal was opened. The Cleveland left New York on October 16, 1909, and took 108 days to proceed across the Atlantic to ports in the Mediterranean, Suez Canal, India and the Far East before finishing her world cruise in San Francisco on January 31, 1910. Passengers then returned to their homes from the West Coast by train San Francisco to New York by way of Suez. Cunard Line’s claim that its 19,680-ton Laconia made the first world cruise in 1922-23 is correct only insofar as this was the first complete circumnavigation of the world by a cruise ship, something obviously could not be done before the Panama Canal opened in 1914. The first full circumnavigation by the Laconia thus left New York in November 1922, took 130 days and called at twenty-two ports on her way around the world. But this was only one of four world cruises that winter. In fact, world cruises boomed in 1922-23, with the Laconia being only the first of four ships to leave New York on world cruises that winter. The others, booked either by Frank C Clark or by American Express, were United American Line’s 19,653-ton Resolute, Canadian Pacific’s 18,481-ton Empress of France and Cunard Line’s 19,602-ton Samaria, which sailed in the opposite direction from the other three, proceeding from west to east. Finally, for a world cruise of a totally different kind, one can choose the French Line CMA CGM. Its Columbus Loop service now offers a total of nine partial world cruises throughout the year, with the 89,787-ton CMA CGM Dalila, built in 2011, and 90.931-ton CMA CGM Figaro and CMA CGM La Scala, built in 2010. These three ships run between New York, Norfolk and Savannah on the East Coast and Seattle and Vancouver on the West Coast, sailing by way of the Suez Canal, or sometimes the Cape of Good Hope, and ports in Malaysia, China, South Korea and Japan. As with the Cleveland’s cruise of 1909, one must travel by train or plane between the two coasts of the United States in order to complete a full round-the-world trip. 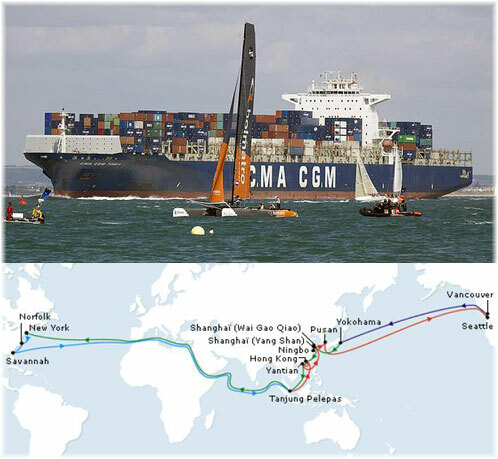 Ports of call in Asia include Tanjung Pelepas, Hong Kong, Yantian, Shanghai and Pusan on the way out from New York and Yokohama, Shanghai, Ningbo, Hong Kong, Yantian and Tanjung Pelepas in the opposite direction back from Seattle. These modern container ships carry seven passengers each in three double cabins and one single, come equipped with swimming pools, and meals are taken with the officers. Fares are set at €100 per person per day and include full board, port charges, deviation insurance and complimentary French table wine with lunch and dinner. CMA CGM Dalila and Figaro fly the French flag, while CMA CGM La Scala is registered in London. Part voyages are also possible but the full 112-day round voyage from New York to Seattle and back, or vice versa, costs €11,200 (about $15,495 or £10,075). New York to Seattle is €6,000 (about $8,300 or £5,395) for 60 days and Seattle to New York €5,200 (about $7,195 or £4,675) for 52 days. The next sailings from New York are by La Scala on August 7, Figaro on September 16 and Dalila on September 30, followed by La Scala again on November 25. Sailings from Seattle are by the Dalila on August 8, La Scala on October 3, Figaro on November 14 and Dalila again on November 28.